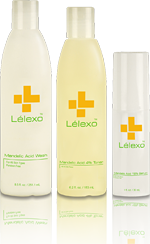 Finishes by Fonda Jo is pleased to offer the Lélexo™ line of skincare products. The beneficial effects of Vitamin A Propionate are increased further when combined with Palmitoyl Pentapeptide-3 and Acetyl Hexapeptide-8 in Lélexo ProVitalize Level I, II and III. These are the first Vitamin A products to combine both Vitamin A Propionate and Peptide together in one formulation. Benzoyl Peroxide. Mandelic Acid Scrub also available. Mandelic Acid 4% Toner is a clarifying tonic, which help dissolve dead skin cells and clear the skin of residual bacteria. It can also be used to cleanse and degrease at any time. Mandelic Acid 10% Toner also available.